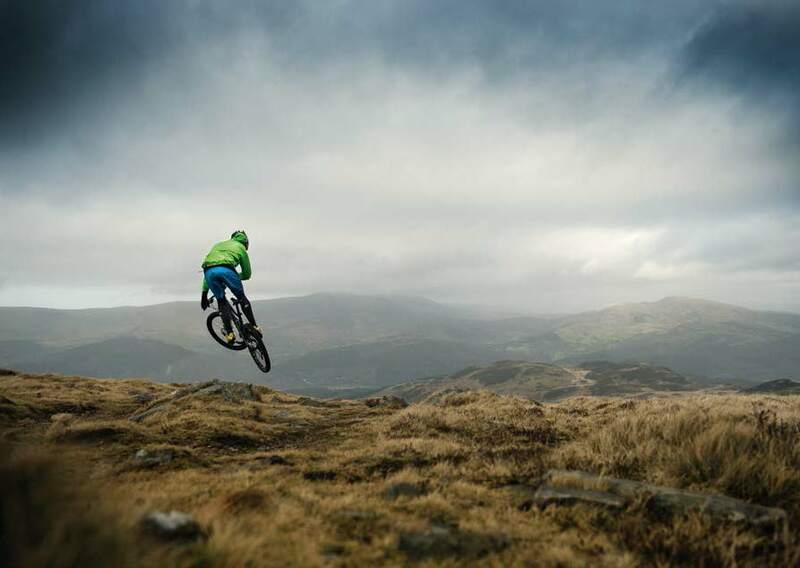 Pete Scullion guides you up this Welsh mountain monster. A classic ride has us jumping for joy! With a WSW gale coming in off the sea, any exposed skin quickly turned blue and Sam’s fingers were suffering both on the bike and behind the lens. Both Sam and myself set about keeping pace, or at least trying, with John, a recently-promoted Elite XC racer. Cold legs and a stinging wind made a mess of my lungs early on and it wasn’t long before I let my talking do the riding, imparting every myth and legend I could to try to keep John interested and not, therefore, galloping off up the track. The flatter ground around the summer farm buildings of Haffoty Gwastadfryn offers some relief to the legs, but so far the going is easy compared to what lies ahead. After a long traverse across open – and windy – grassland, the path hooks left up the hill and steepens a fair bit towards Rhiw Gwredydd. From the gate at Rhiw Gwredydd, the wind really started to show its hand and, once out of the protection of the valley below, we were in for a beating. Birds that appeared as dots in the sky would all of a sudden be on top of us, carried at breakneck speed on the wind. A recently surfaced trail here shows the dedication of the volunteers that work on the hill and gives easy access across some fairly boggy ground and to where the real fun starts. Leading immediately off the new grading sees a short, sharp climb graded with slabs of local rock that litter the hillside. The hard standing is a welcome change but it is short-lived. High on the mountain, the trees are a distant memory and soil is replaced with pea gravel and the black peat of upland bogs. The igneous rock dominates and the bridleway from this point on is a mess of rubble from years of weather. What smooth track there was on the day was made more difficult by the fact that it had recently thawed and was similar in consistency to wet sand. Onwards and upwards. Let’s ignore the weather for moment and concentrate on the real reason why we came up Wales’ second highest peak. Shortly before the final ascent to Penygadair, the path crosses a saddle which has no cover save for an ellipse of boulders and was still full of snow from recent flurries. Riding from here on up is more straightforward as the gradients flatten and the view out to the sea is spectacular, as is the northern face of Cadair Idris. Had we been blessed with the weather we’d wanted, it would have been hard to get us off the hill. It was here that the wind started to bite though. With the climb to the summit being steep and I’d say unrideable, turning back was definitely at the front of our minds. The wind over the saddle was easily in excess of 80mph and I could happily lean into the wind until I could almost touch the ground, while my bike stayed airborne once I’d hoisted it off the deck. In the end, the decision of whether or not to reach the cairn at the top was made for us. A bank of cloud rolled in and with the cliffs above Llyn y Gadair being only a few metres away from the path in places, it wasn’t a place you’d want to get dumped off if you couldn’t unclip. Had the clouds produced any rain at this point we could have been in real trouble as the wind-chill factor was the worst I’d ever encountered. After taking a few snaps and loading up on cereal bars, we made a sharp exit. Let’s ignore the weather for moment and concentrate on the real reason why we came up Wales’ second highest peak. 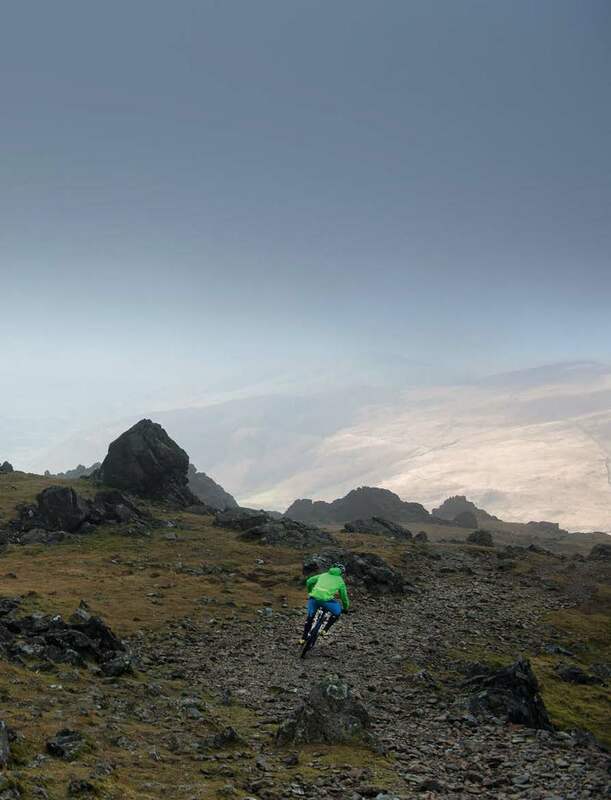 The run off the top is a most exciting affair and in good conditions, isn’t so long that you wouldn’t discount heading back to the top for another go. Brakes, forks, shock, hands will be roasting hot within seconds and a stark contrast to both bike and body moments earlier. I can’t think of a single moment where I could relax, and what made the climb hard certainly made for a great descent. Line choice and caution both need throwing to the wind here, and being able to react quickly to rocks moving about unexpectedly beneath your wheels pays dividends here. Even the largest of boulders can – and will – move under you. A clean(ish) run will see your speed ever-increasing and by the flag-paved section previously discussed, letting go of the anchors will see you reach a speed far greater than anything you’re comfortable with. We were all glad we packed kneepads for the descent as any errors here will be punished harshly; there is little safe run-off as you’re essentially riding a worn-in route through a boulder field. Large pieces of the mountain sit loose all around, so you need all your wits about you here. An amazing backdrop to stunning natural trails. Like a downhill golf green. At the Rhiw Gwredydd gate you can clearly see the signs stating that the Dolgellau path is not for bikes, so it’s back the way we came. The descent from the gate, while massively fun, is as exciting as the upper slopes but in an entirely different way. The best way to describe it is as the Welsh version of the Kamikaze down Mammoth Mountain. Dust is replaced with golf-green like grass and boulders with sheep. How fast you take this descent is all down to your willingness to keep off the brakes – and the odd gate. Traction can disappear rapidly in the wet here, but the rocks above can hardly be described as grippy with the addition of moisture, so you’d be more than likely to have changed your approach by this stage in any case. Expect to have water streaming out of your eyes and a decent quantity of sheep effluent flying off your tyres down here. This is a fast one and you will effectively be crossing farmland, so take care especially during lambing season. Cruising back down the road towards the church in Llanfihangel, the wind had dropped so we didn’t need to shout just to be heard, grins were of the Cheshire cat variety and talk soon turned to food. The wind certainly made us forget about the climb and in some cases, pedalling was actually not necessary on the ascent due to the strength of the gusts. We were at the summit before we knew it, although on a fine, sunny day, you could afford to take your time on this route. Back at the bottom, after we’d changed costumes and loaded the bikes back into our respective vehicles, it was off to Dolgellau to find a suitable outlet for foodstuffs. Initial internet research indicated that the local pubs were the best source of food, but neither were serving when we rocked up at 3pm. I must say, and John quickly reminded me of the fact, that I looked more than a little deflated when food was not forthcoming. Even on a fine day, this route will take it out of you, and food was at the top of the agenda once we’d made it back to civilisation. A quick march about the main square and we came across Y Sospan (The Saucepan). We had clearly stumbled on a gem here. We were the only customers upon entry, but it quickly filled up with locals speaking only Welsh and music in the same language was playing over the PA. Rally legend Gwyndaf Evans popped in for a cup of tea and a cake while we waited for our orders, although it took me several minutes of staring to put the name to the face. He hasn’t changed one bit since he raced for Volkswagen’s WRC team all those years ago and he now owns the Ford garage in town. Service was swift and the portions hearty and cheap. Our three orders reflected the variety of fare on offer. Sam went for the soup and sarnie option, a beef and caramelised onion sandwich with home-made soup, I’d opted for ham and double egg with chips, while John went for the pro-veggie lasagne option. We were quickly accosted by some elderly locals who regaled us with the history of Dolgellau and its surrounds. Sam’s camera was what broke the ice and we were told that the top of Cadair Idris would make a great place to take photos, unaware that we’d recently been up there. The best story was certainly that of the gentleman, still alive today, who holds the dubious honour of being the only one to jump off the cliffs of Penygadair into Llyn Cau. Wimberries (another name for bilberries) also made a comical appearance and it was then we met the affable and knowledgeable host, Hazel, clearly used to dealing with eccentric locals hard of hearing. She clearly knows her turf well and mentioned that the pubs on the square were the best place to get local and cask ales should that tickle your fancy. Head to the Unicorn Inn on Smithfield Square for some local tipple. Who wouldn’t want to ride here? The mountain and I have history. Whether you approach Wales’ second highest peak from Minffordd, Dolgellau or Llanfihangel-y-Pennant, Cadair Idris is an imposing sight. 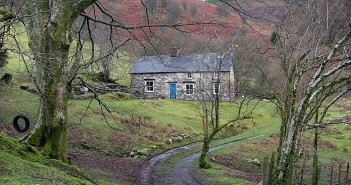 Along with its adjacent peak, Mynydd Moel, it stands some 300m above the surrounding hills. With a sharp drop to 14m above sea level on the northern side and 25m on the southern side, the ‘Seat of Idris’ rises sharply out of the valley on either side to a height of 893m above sea level. For as long as I can remember, my parents dragged us up the Tal-y-Llyn side of the hill along the Minffordd Path to Llyn Cau. We would be lured the entire way by the promise of chocolate. Once there, we’d be offered even greater quantities of confectionery in return for making it to the summit. Unlike Snowdon from the Pen-y-Pass, nearly all the height to the summit is gained on foot. On a hot, sunny day or in a torrential downpour, I can safely say from experience this walk can be as unpleasant as anywhere else. That said, I’m sure my love of the outdoors comes from spending so much time there as a child and for that I can’t thank my parents enough. The crags of Craig Cau that loom over Llyn Cau are not the place to be in these circumstances, with a precipitous cliff dropping several hundred metres to the water below. Despite what seems like a complaint in the previous paragraph, I must say the summit, Penygadair, on a clear day is one of the best places to be with or without a bike. 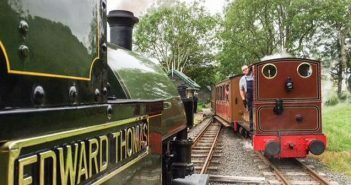 The west coast of Ireland is sometimes visible across the Irish Sea, Snowdon and Glyder Fawr can be picked out to the north and the old slate mines of Corris litter the hills to the south. Everywhere you look is like a million postcards strewn together, and you can see why this part of Wales thrives on tourism in the face of declining industry. That said, being such an isolated and tall peak means weather can quickly roll in off the sea. With little cover save the hut at the summit, being prepared for all eventualities and keeping a keen eye on the south-westerlies pays dividends. More than once on a family outing have we been caught in a hailstorm in low cloud that appeared out of an azure sky. The crags of Craig Cau that loom over Llyn Cau are not the place to be in these circumstances, with a precipitous cliff dropping several hundred metres to the water below. An artist’s impression of the full adventure. 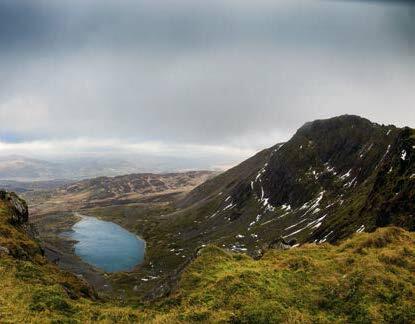 Cadair Idris is a mountain steeped in myth and legend. The winds that whip off the sea bring echoes of howls produced by the Cwn Annwn, the spectral hounds of Gywn ap Nudd, King of the Otherworld of Welsh mythology. Legend has it that their howls foretold death to anyone who heard them. So steer clear of any men of nobility flanked by red-eared canine apparitions seen on the mountain. Bards would often sleep on the slopes in hope that they would find inspiration. A cirque glacier gives the mountain its unique appearance and explains the dramatic appearance of Bwlch Llyn Bach and the presence of Tal-y-Llyn Lake. This glacial activity explains a lot, although not all of the myths. Directly translated, the mountain’s name is ‘Chair of Idris’. One myth has it that a giant of Welsh mythology going by the name of Idris, a mathematician and astronomer, would sit in his ‘chair’ and gaze into the night sky. The other is that a 7th century prince of Meirionnydd, Idris ap Gyddno, defeated the Irish in a battle on the mountain and the Irish lent their name for ‘city’ or ‘stronghold’, ‘cathair’, to create ‘Cathair Idris’. Personally, having been taken up this mountain and to Giant’s Causeway in Ireland as a child, the idea of a chair for a Welsh giant and a causeway to Scotland for his Irish counterpart, Finn McCool, still does far more for my overactive imagination. The myth that the surrounding lakes are bottomless isn’t all that hard to believe and has a fairly impressive visual manifestation that doesn’t require a wetsuit or diving equipment. Approach Llyn Cau from the Tal-y-Llyn side and look up at the crags at Penygadair on a still day and the ground appears to open up at your feet. The reflection on the lake of the cliffs above give the appearance of a bottomless pit flanked by jagged rocks. 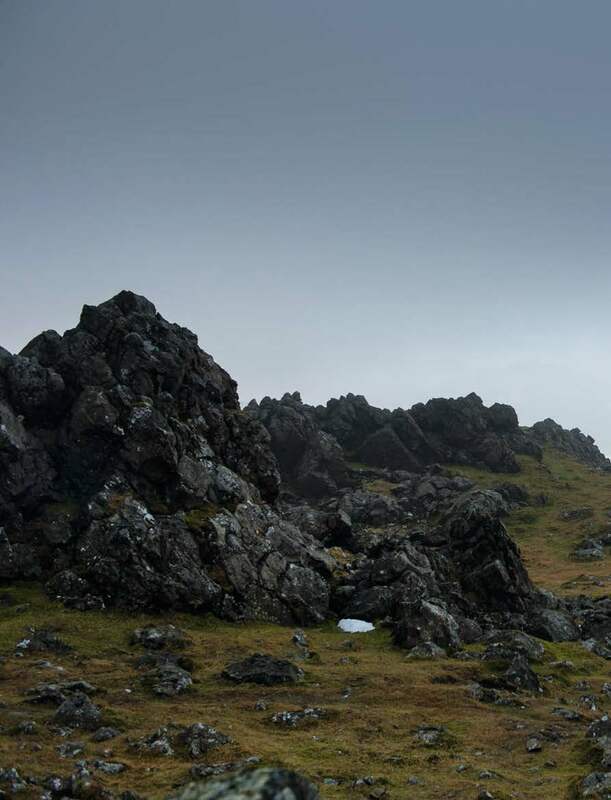 A battle between a wizard and a Balrog atop Durin’s Bridge would not look out of place here. Those who do come across any of the figures mentioned above may have fallen foul of the final myth surrounding Cadair Idris. Legend has it that anyone who sleeps on the mountain will awake either a madman or a poet. Bards would often sleep on the slopes in hope that they would find inspiration. More photo opportunities than you can shake a stick at. To the top, by bike. Llangfihangel-y-Pennant is the start of the only fully legal route to the summit on a bicycle. The vast majority is rideable, depending mostly on the quantity of skill and stamina available. The climb to the top steepens gradually and for the most part is covered in grass clipped short by the sheep that litter the mountain. The bridleway soon becomes doubletrack which makes the going easier, despite the sharpening contour lines. The western-facing slope is slightly more forgiving than its southern counterpart but you will cross plenty of contours as the path makes its way north-east up the mountain before hooking west-north-west at Rhiw Gwredydd towards the summit. After climbing 200m, the cover of trees thins out and the track makes its way across open upland until the plants thin out altogether exposing the Ordovician igneous rock, taking its name from the Romans that settled here shortly after 77-78AD. This igneous rock is the mainstay of the trail from the last gate and favours the keen eye and sharp handling skills to avoid the sharper edges and ward off any flats. Some of the path has been ‘paved’ with this rock by the loving hand of volunteers with the standard issue water bars that lend themselves nicely to a rapid loss of atmospheric pressure inside a pneumatic tyre or the rapid dismounting of the organic body atop a cycle. It does make the ascent more rapid although the untreated surfaces can make for hard pedalling in wetter conditions. All this does lead to a rather dramatic and exciting descent with high speed being the main feature over bedrock, boulder and shale. 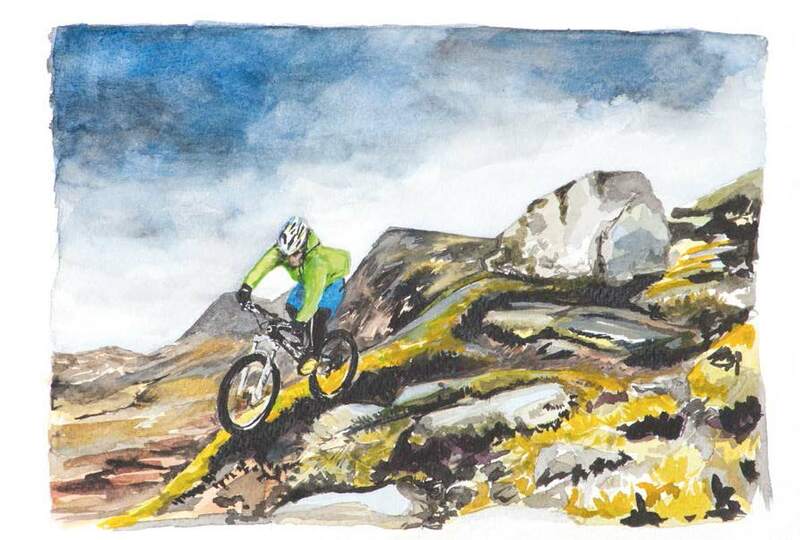 The short grass can be fairly lethal even with the slightest hint of moisture and, like the rocks above, grip can come and go in an instant with any chosen tyres never quite being good enough everywhere. Just the way I like it. The OS map also doesn’t quite do the Pony Trail justice as there is a far greater number of switchbacks and sweepers on this route. The red dotted line that streaks its way up the hill is understandably direct and can’t account for the movement of feet and wheels over the years. A satellite view will give a much better impression of the way in which the path snakes its way up and down the mountain. With Cadair Idris being such a tall and lonely peak compared to its surrounds, finding the mountain is very easy. As mentioned previously, the bridleway from Llanfihangel-y-Pennant is the only legitimate route to the top and back down again on a bike. Any other routes are footpaths and shouldn’t be ridden regardless of interpretation of the laws surrounding their use. Signs are clearly visible on the path down to Dolgellau, so the landowner would unlikely be willing. The Minffordd Path is the most popular with walkers and should, therefore, be avoided for that reason also. The route may not be the longest, but with an ever-increasing gradient from the start to the summit, it’s tough going. Being Wales’ second highest peak, it is a popular route with walkers. Expect reception from walkers to be closer to that in Scotland than in the Lakes, but most of the tourist traffic is contained by Snowdon. Sunny weekends will likely be busier but never swarming with bodies. This part of Wales is too sparsely populated for any serious traffic. The route may not be the longest, but with an ever-increasing gradient from the start to the summit, it’s tough going. You will need to be fit enough for a day on the hill to tackle this route as time will slip away with mechanicals, punctures or injuries. Getting to Llanfihangel-y-Pennant is fairly straightforward off the A487. This road links to several other trunk roads in mid/north Wales, so access is good from all directions. Take the B4405 from Minffordd towards Tywyn until you get to Abergynolwyn, 4.5 miles down the road. Turn right off the main street towards Llanegryn and follow signs for Castell y Bere until you see signs for Llanfihangel. The best place to park is the car park opposite the church in the village (grid reference SH 672 089). Staying there and eating there. Ordnance Survey’s OS Explorer (1:25,000) for Cadair Idris and Bala Lake is the best map for this route. 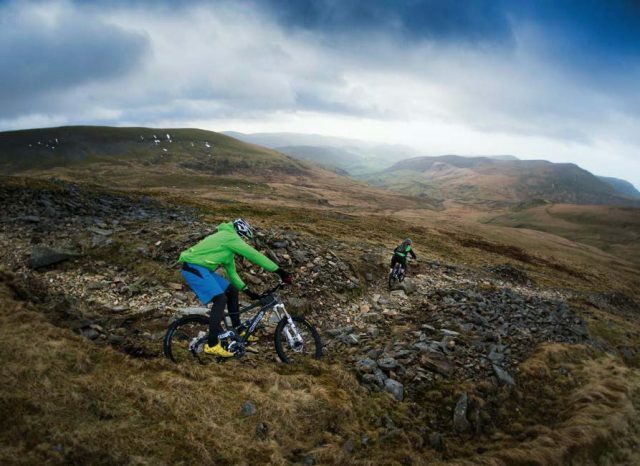 For anyone wanting to sample more of what Wales has to offer for the mountain bike enthusiast, both Coed-y-Brenin and Cli-machx trail centres are a short drive away. The former is home to some of the finest singletrack in the UK, with routes for the beginner all the way up to the 37km black route appropriately titled ‘The Beast’. The latter is a much shorter loop but provides plenty of great riding in a short space of time. The final descent is a particular highlight. 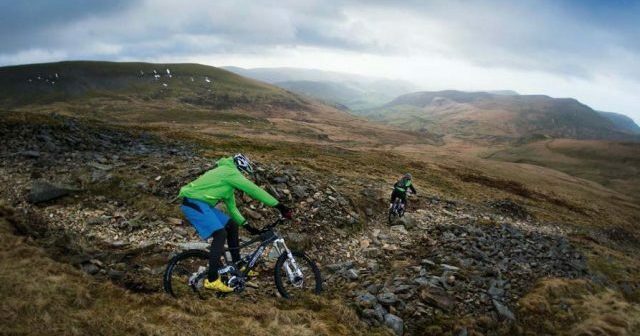 Machynlleth allows good access to the Dyfi Forest but getting a local to show you the best trails is advisable. Dyfi Forest is enormous and it would be easy to get lost. Watch out for WRC teams doing their testing here in the lead up to Wales Rally GB! 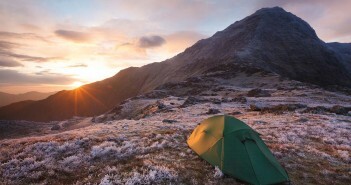 Head to mbwales.com for details on all the Welsh trail centres.